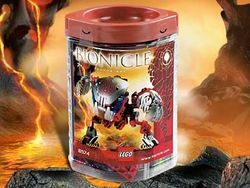 8574 Tahnok-Kal is a BIONICLE set released in 2003. It contains Tahnok-Kal, who was the Bohrok-Kal of Electricity. Like the other Bohrok-Kal Tahnok-Kal came with a Krana-Kal. Pushing the lever on its back will cause its head to spring forward. This page was last edited on 28 April 2016, at 17:57.